The best of both worlds! Bring Vegas slots, Keno, Blackjack, and Poker games right into your house. 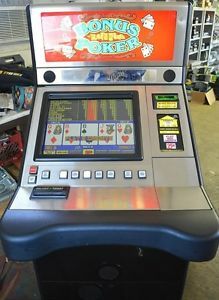 There are 69 games on this machine! Sure to be a game everyone will enjoy. We specialize in overseas container loads of Game Kings. We can install coin gear as well. Ask about bulk buying discounts for overseas shipment. This machine also has a ticket printer.